Applegate, the nation’s leading natural and organic meat brand, continues its mission to bring consumers food products with clean label ingredients through a new partnership with Whole30. As an official Whole30 Approved partner, Applegate is making it even easier for customers following the Whole30 eating program to find compliant natural and organic meat products that taste great. “At Applegate, we are motivated to continuously offer delicious food choices that fit in with a diverse range of eating habits and lifestyles. 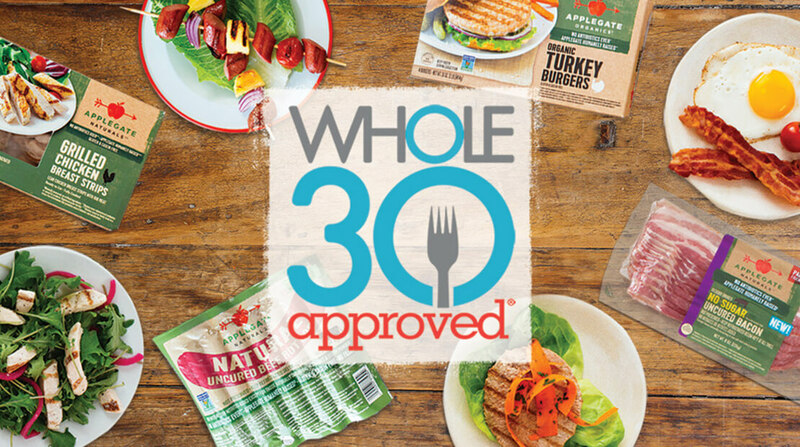 We are delighted to be working alongside Whole30 to deliver Whole30 compliant options to consumers,” said Nicole Glenn, Applegate vice president of marketing. Whole30 is a 30-day dietary reset designed to help people improve their health, create new dietary habits, and change their emotional relationship with food. It was co-founded by Melissa Hartwig in 2009 and has been changing lives ever since. Applegate offers a wide array of Whole30 Approved products that make pushing the reset button on health, habits and relationships with food, delicious and worry-free. Whole30 Approved products include Organic Turkey Burgers, Natural Grilled Chicken Breast Strips, Natural No Sugar Bacon, Organic Dinner Sausages and Natural Beef Hot Dogs among many others. For a complete list of Applegate Whole30 Approved products, visit http://applegate.com/whole30. All Applegate Whole30 Approved products contain, no added sugar of any kind, no grains, no dairy, no legumes, no alcohol (with the exception of wine vinegars) and high quality protein with meat sourced from humanely raised animals that were never administered antibiotics or growth promotants. Applegate Whole30 Approved products can be found at well-known retailers such as Whole Foods, Target and Fresh Direct. Please visit http://applegate.com/locator to find where the products can be found throughout the country. Think of the Whole30 like pushing the reset button for your health, habits and relationship with food. For thirty days, you’ll eat nothing but nutrient dense, whole foods. You’ll eliminate foods that nutritional science and clinical experience have shown to promote unhealthy cravings and habits, disrupt your metabolism, damage your digestive tract, and burden your immune system. After thirty days you’ll carefully and systematically reintroduce those foods, paying attention to how they affect you in a variety of ways like mood, energy, digestion, body composition and more. With that knowledge, you can create the perfect diet for you: a nutrition plan that is balanced, sustainable and keeps you looking, feeling and living your best. About Whole30: Whole30® has been changing lives since 2009, when Melissa Hartwig blogged about a 30-day life-changing dietary experiment she recently completed. Since then, millions of people have transformed their health, habits and relationship with food through the Whole30 program; eliminating cravings, improving energy and sleep, improving any number of medical symptoms, and losing weight healthfully and sustainably. The Whole30 website currently serves 2 million unique visitors a month, with readers checking in from more than 100 different countries, and has a combined social media base of more than 2 million fans and followers. Let Melissa and the Whole30 team help you create the perfect diet for you: a nutrition plan that is balanced, sustainable and keeps you looking, feeling and living your best.